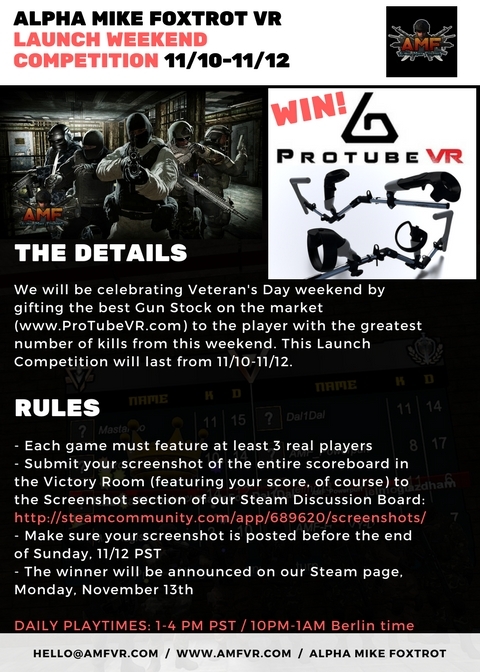 AMF VR Launch Weekend Competition - Win a ProTube VR! NEW Knife mechanics to bring out the Wolverine in you & reduce kill trading! Sign up for BETA Weekend 1 starting this Friday! If you qualify, you will receive an email from us listing out all the play times for each BETA session this coming weekend. Good luck and Adios, My Friends! We will be handing out Steam keys to YouTube/Twitch game reviewers and all press & media prior to the official release of Alpha Mike Foxtrot. If you are interested in reviewing our title, please contact us with your credentials, link us to your page, and/or show us previous reviews you have conducted. Thank you for your interest! Stay tuned as we will be announcing special features and game updates very soon! Besides our newsletter, don't forget to subscribe to our YouTube page, like our Facebook page, and follow us on Instagram. AMF will be released on Steam for the HTC Vive come September 15th! Alpha Mike Foxtrot takes multiplayer FPS in VR to the next level through its dynamic game play, arcade-styled pacing, and interactive mission modes. 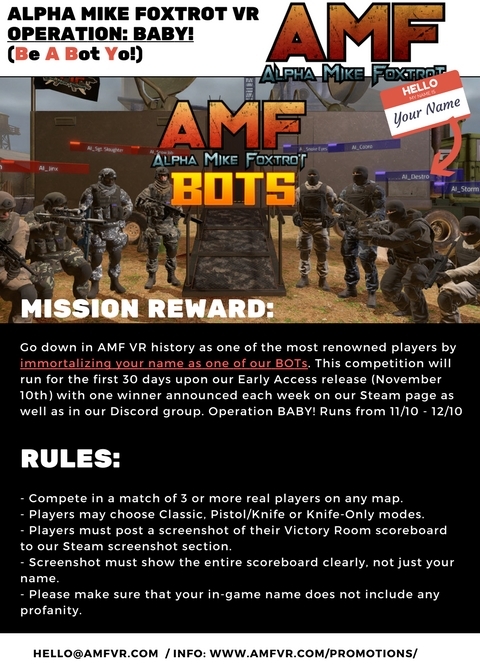 On 9/1/2017, say "Adios, My Friend" to Onward and Pavlov and yell "Adios, Mother F*@&!#" at the next player you slay in AMF.